Corals are a beautiful - and important - part of our ocean. But they can’t move around the ocean floor - so, how, exactly, do they find mates? Reef-building corals, also known as “stony” or “hard” corals, reproduce in several ways - one of the most common of which is broadcast spawning. This bizarre and beautiful phenomenon starts when male and female corals release reproductive cells, called gametes, into the water. Coral reefs may be separated by wide distances, so this tactic enables gametes to mix genetics and spread their offspring over a broad geographic area. Male and female gametes combine together and form a baby coral, called a planula. Planulae float in the water for days or weeks until they find a hard surface to which they can attach. Along many reefs, coral spawning occurs as a synchronized event, when many coral species release their gametes around the same time. With all the corals on a reef releasing gametes at the same time, there’s a better chance of escaping hungry predators and a greater possibility that many different genetic combinations may form. More genetic diversity means there’s a better chance that at least some of the new corals have gene combinations that will help them survive extreme temperatures or diseases. And with rising ocean temperatures and increasing acidification, it’s important for corals to be as resilient as possible. Not all species of coral are broadcast spawners. 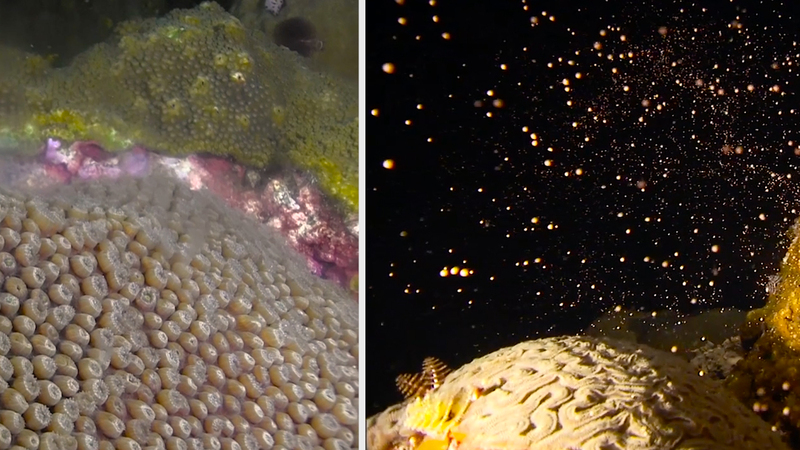 In some areas, mass coral spawning events occur one specific night per year and scientists can predict when this will happen.